1�hr drive from Johor Bahru). 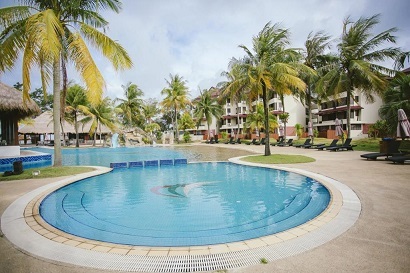 It has clean sandy white beaches with a lush tropical forest that goes for about 25 kilometres. You can walk nearly 50 meters into the sea and still the depth is approximately 4 feet deep). 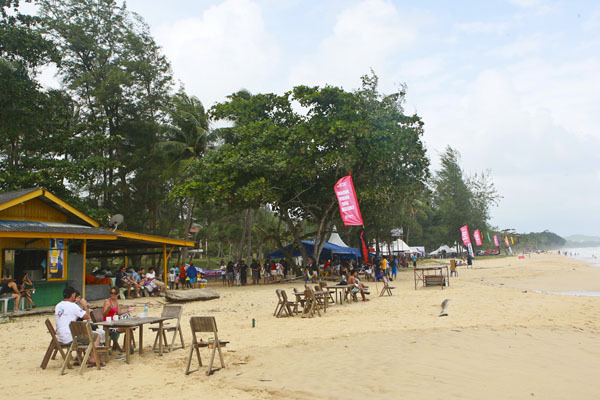 Desaru is a popular destination for tourists as well as locals. It is a village of casuarinas with 25km of unspoiled beaches and a lush tropical forest. 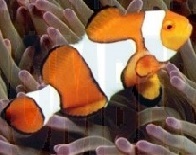 The clean water has made many water sporting activities such as snorkelling, fishing, boating and canoeing possible. You can do also other activities without the blue sea. 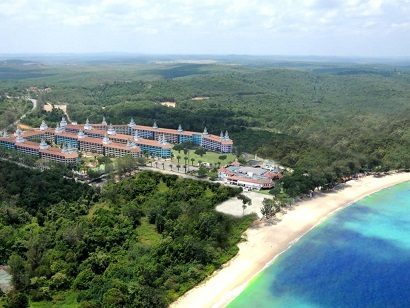 You can do golfing, jungle trekking, horseback riding and tennis. 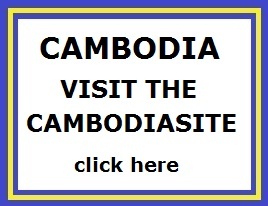 There are many resorts and hotels here that cater to a variety of budget. 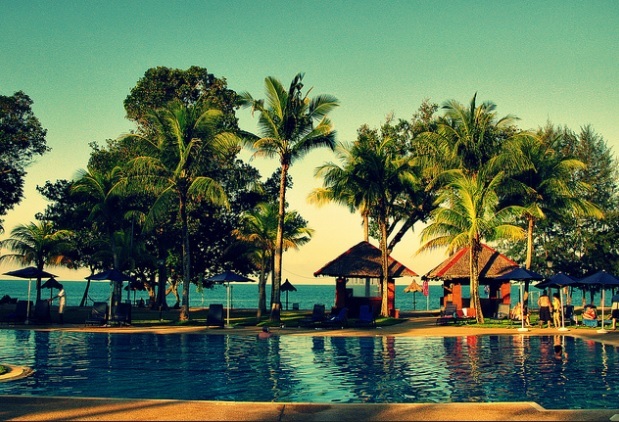 There are resorts and hotels for the budget traveller as well as families seeking fun in the sun. The beaches are lined with casuarina trees dotted by rustic fishing villages. Nearby are cascading falls, natural lakes and jungles where one can go jungle trekking. To make your visit more memorable, visit Tanjung Pengelih to see the relics of World War Two and the historical relic of the Malay Johor Riau Empire at Johor Lama. 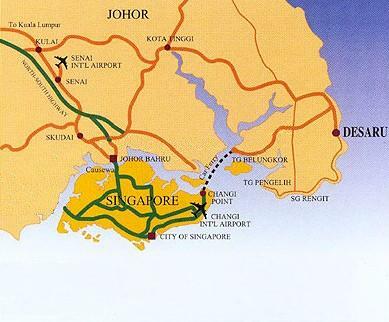 Getting to the largest district of Johor at the south-eastern end of the peninsula, requires an hour's drive from Johor Bahru. From the north, the easiest way is to take the Kulai exit of the North-South Expressway followed by a 90-minute drive to the historic town. The coastal road is a lot more scenic. There are reliable public transportation services from all major towns. There is a direct ferry service between the Tanah Merah ferry terminal in Singapore and Sebana Cove, about an hour from Kota Tinggi. Another popular out-of-town attraction is Kota Tinggi. This attraction of the waterfalls is situated at Lombong. The water cascades from a height of 36m down a steep precipice into a pool deep enough for swimming.The cool waters have beckoned many tourists and locals alike. It is a good spot to take a fresh mountain air. The Swiss-style chalets equipped with cooking facilities are available for visitors seeking an overnight visit. At the base of the falls there are also public changing rooms, camping grounds, and a restaurant. 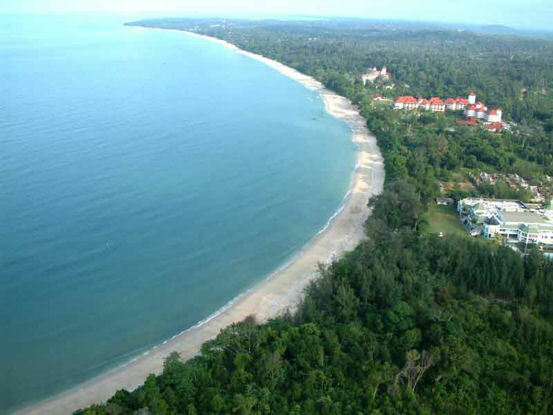 Some 10km south of Dasaru is another excellent stretch of beach known as Teluk Ramunia. About 8km north of Desaru (20 minutes) is the Fishermen's Museum at Tanjung Balau which displays fish traps and equipment used by local fishermen and various artefacts of the trade. allowing them to know more about ostriches, their habits, mating seasons etc. It is open daily from 10am to 6pm. Entrance fees are RM8 for adults and RM4 for children below 12. Group rates of RM6 for 20 or more adults and RM3 for children are also offered. For enquiries, contact Teh 019-6108544 or Joyce 07-826 5846. The Desaru Fruit Farm is planted with many different types of tropical fruits. Some fruits are seasonal, like Durian, Rambutan and Mangosteen whilst others like Papaya, Banana, Pineapple, Rose Apple, Star Fruit, Lime, Orange and Coconut are available all year round. The experienced guides will give talks on the different plants and show you around the farm in a leisurely bullock-cart ride or in your own vehicle. Slightly less than half a millennium ago, this small village strategically guarding the upper reaches of the Johor River was the seat of the Johor Sultanate. Though all that remains are a restored earth mount and fragments of stone walls, a fort built in 1540 by Sultan Alauddin Shah - son of the first Johor Sultan - used to exist. The Portuguese who had taken Malacca attacked in 1587 and completely destroyed the fort despite it being defended by 8,000 of the Sultanate�s warriors. "The fortress made of rocks and turf is said to be one of the best defensive forts built along Sungai Johor to stop the Portuguese after the fall of Malacca. Though "tourists" are only taken to the hilltop fort which now appears as a plain well-maintained field surrounded by bunds, a walk around Kampong Johor will lead to more hidden bunds. Kampong folk say the bunds cover 2.4 km through the rubber plantation surrounding the small kampong. Also found here are two tombs in two different sites. One near the fort is unidentified while the other in the rubber estate belongs to the royal midwife. 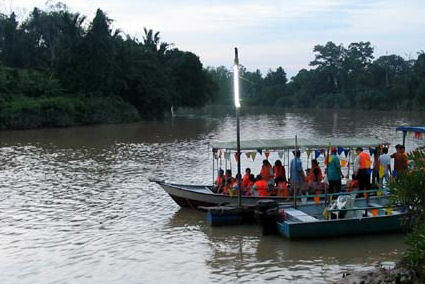 Further upstream is Kampong Panchor which was made a ruling centre by Sultan Abdul Jalil Riayat Shah IV, the 11th Sultan of Johor, under the name Kota Panchor. Besides the remains of the fort and still-hidden historical relics, the kampong which is surrounded by oil palm plantations takes pride in another two ancient tombs. Drive through the plantation dirt road to reach an isolated mausoleum of Sultan Muzaffar Syah atop the hill in the middle of Bukit Seluyot. This is located by the river too. The third Sultan of Johor was not alone, for buried in the same resting place was his sister Raja Fatimah and nephew Sultan Abdul Jalil." This quaint coastal fishing village is well known for its fresh seafood, especially its crab delicacy. You'll have to go to Kota Tinggi. A rapidly expanding town, the hustle and bustle of this town is charming as the traditional blends well with the modern. Modern progress is taking place here with many new buildings as well as the Government's plan to move the administrative centre from Johor Bahru to Kota Tinggi. The boarding point for this firefly excursion is at the riverbank near Jalan Tepi Sungai, opposite the row of shops. Before going on the boat you'll have to put on life jackets. These fascinating insects are found in abundance on the berembang trees that line the banks the Johor River. The scene is very beautiful. You'll have a close encounter with one of nature's mesmerising phenomenon - the beautiful presence of fireflies, glowing in the thousands here. 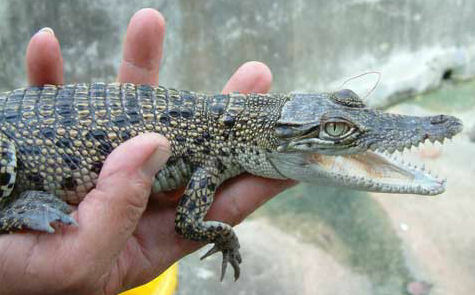 The Crocodile Farm in Teluk Sengat was established in 1979. There are about 500 crocodiles bred in the farm through natural copulation. These crocodiles belong to the Crocodylus Porosus species. The farm's main export is the crocodile's meat and skin, which can be made into leather goods. 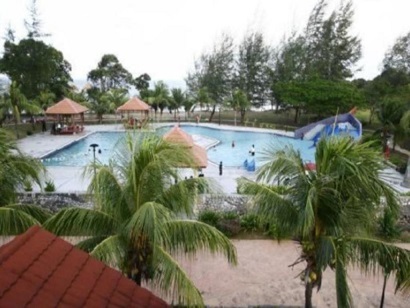 There's a wide choice of beach resorts along its long coastline � at Teluk Mahkota, Tanjung Balau, Desaru, Batu Layar, Teluk Punggai and Teluk Ramunia. 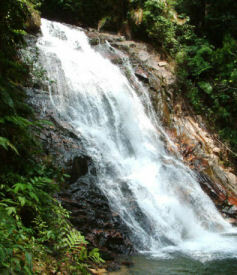 Those who like to stay near the famous waterfalls of Kota Tinggi can check into the Kota Tinggi Waterfall Resort. 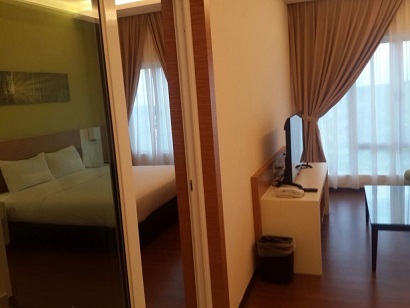 In town itself, there is quite a number of budget hotels scattered all over. Golfers also have a few choices, one of which is Sebana Cove. The all-in-one retreat has a marina, 18-hole course and resort. Guests can choose from 40 executive rooms, 20 suites and 24 two-bedroom apartments housed in two-storey blocks. 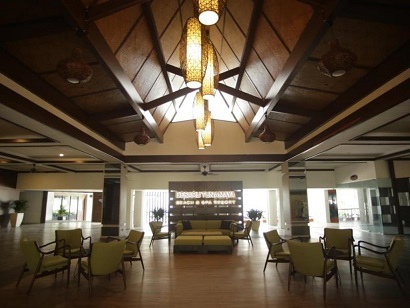 The main clubhouse has a swimming pool, food and beverage outlets, gymnasium, sauna and tour desk. Have a look at the School Holidays and Public Holidays!